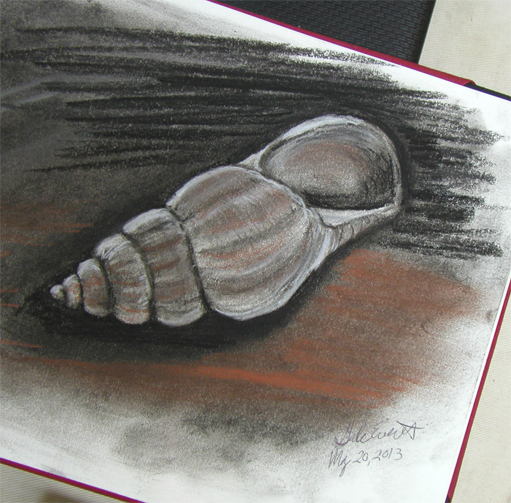 This was today’s “quick” drawing of a sun-bleached whelk shell brought back from Kauai. I think I must be wanting to head to the coast. Maybe I just want to be back in the islands away from responsibilities of life? Dreaming of less stressful days…. Anyway, it was an interesting exercise even if I didn’t quite get the correct proportions. Maybe I’ll have to venture onto a larger paper when I figure out a subject to pursue. Charcoal plus red & white conte crayon in a 8.5″ x 12″ Vang sketchbook from France.